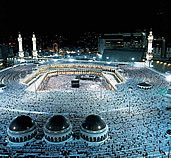 - The best time to visit the mosque is immediately after the afternoon prayer, and it would be sometime around 5 P.M. It is forbidden for woman to enter the mosque wearing short trousers, short sleeves and short skirts. Also tight clothes are not welcomed. Make sure that your shoulders and at least knees are covered with clothes. It is also forbidden for woman to enter the mosque without the scarf, so if you have a scarf (that is big enough to cover your hear completely) use it, and if you do not, you can easily borrow one in the mosque (if you are in a large group then it is highly recommended to bring some scarves of your own). It is forbidden for men to enter the mosque wearing short trousers (everything above the knees is considered too short). - Remove your shoes before you put your feats on any carpet, even if that carpet is in front of the mosque. - If people are praying in the mosque when you arrive, wait for prayer to be finished before entering the mosque. - If you come before the prayer and you want to be present in the mosque during the prayer (for any other reason but praying), it is highly recommended to ask muezzin (or some other official) where you can sit and watch. - It is also good practice to ask for permission for making photos and video recordings of the interior and/or exterior of the mosque. - Visiting Emperor’s mosque is free of charge, and although you can leave alms in donation boxes, you are not required nor expected to do so.